The foodservice industry contains over 13MM employees and over 29K brands that are seeking content from reliable and next generation sources. 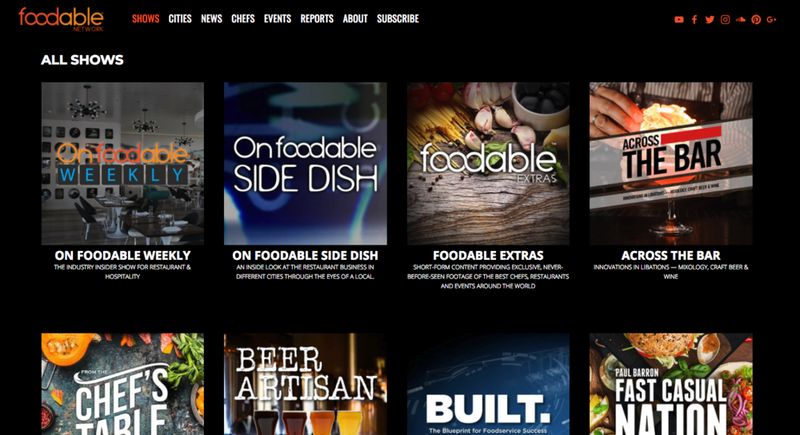 Foodable Network is one of our featured platforms that delivers a variety of content aspects to more than 1.7 million foodservice professionals via a variety of distributed media products. Partnered with Apple, Amazon, Google, Facebook and Twitter, Foodable has maximized its platform to reach millions of targeted audience across various distributed media products and is considered the leading new media company in the industry. Fully interactive web and and content solution with full functioning blog platform, video distribution, and podcast integration. This platform features several thousand pieces of content and social connections, membership, and e-commerce elements. Developing 15 shows over three years and over 1000 episodes that feature both studio and on-location video & film. Providing custom research and targeting based on keyword analysis and industry insights to create report content that can be used in editorial, video, and podcast production.